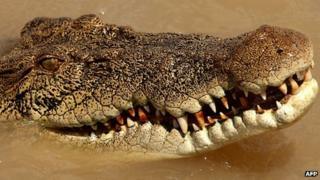 Police were called out to search for a 6ft (1.8m) crocodile reportedly seen on the loose in Bristol. Avon and Somerset Police Chief Constable Nick Gargan said on Twitter that a bus driver had alerted police about the animal earlier. "One of our officers was flagged down by a bus driver today, claiming to have seen a 6ft crocodile... We can't find it," he said. A police spokesman confirmed officers had been sent to look for the creature. Crocodiles tend to congregate in the slow-moving rivers and swamps of Africa, Asia, Australia and the Americas, according to BBC Nature. A previous sighting of a crocodile in British waters - reported in the English Channel - turned out to be a piece of wood.